It warmed up a little this week. There were still some raindrops to play through as all four affiliates got six games in. There were some exciting daily performances from Jeffrey Baez, Cory Abbott, Rollie Lacy, and Bailey Clark. Still, as a whole, it seems most teams can’t get in a groove. It might be the weather, or it might not. It’s also time to see some promotions coming down the pike. Most likely, relievers might be moving around the system. They are struggling to put runs on the board and to hold leads in the bullpen. Zagunis, Davis, and Rademacher are all hitting well, but that’s it. Duane Underwood has a great start this week and Dillon Maples was just plain deadly on Friday as he struck out all four batters he faced. And they all looked silly trying to hit his slider. They are starting to show some signs of life. Alex Lange, Matt Swarmer, and Keegan Thompson all put together some great starts this week. Lange just overpowered Salem last night. The Pelicans just need some consistency at the plate. No one seems to be clicking right now in the batter’s box. At home, they are almost invincible. On the road, not so much. On Wednesday, they put up 17 runs in a hit fest at Bowling Green. However, it is the pitching that is just outstanding. 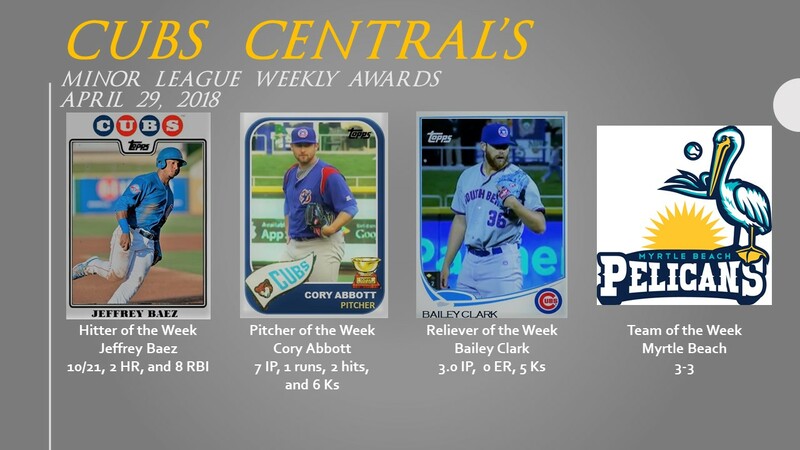 Cory Abbott, Tyler Thomas, and Javier Assad were all great this week and Rollie Lacy and Bailey Clark were just stupendous out of the pen. Austin Filiere is now over .300 and Brendon Little made it past the third inning in his last outing. I am really digging Little’s improvement from start to start. Kudos go out to him and pitching coach Brian Lawrence for the noticeable differences in pitchability. Nelson Velazquez is back and he went 2 for 3 with 2 doubles and 2 RBI in his return. Cannot wait to see him in Eugene in six weeks. Pitchers Jeremiah Estrada and Brailyn Marquez, who both should anchor Eugene’s rotation, threw 2 scoreless innings apiece this week. In addition, Cuban catcher Alexander Guerra seems to be rounding into shape as he is now hitting with regularity including some power. This week he did go yard. And one of my favorite draft picks from last year, Luis Vazquez, is doing very well with the bat. Yesterday, he went 2 for 3. The MLB draft is 5 weeks from tomorrow. This week, MLB Pipeline released its top 100 draft prospects. At first, I wanted to write a full blown article about the rankings. I decided against that as I am off to the State History Fair in Springfield this week and there’s no time or space to do so. Here is who Pipeline ranked at each of the five spots the Cubs pick in the top 100. That doesn’t mean they will be there when the Cubs pick, but the rankings are interesting for value perception of who could possible be there. 24 – Trevor Lanarch – I like the 6’4” lefty OF from OSU. He has dramatically improved this year. two or three years down the road, he could be a power bat that hits 20-25 HRs a year. 62 – Zach Watson – OF – LSU -A speedster, he covers good ground at a premium position. At 6’1” and 165 lbs, he has a lot of filling in to do. 77 – Kyle Isbel – OF/2B – UNLV – His versatility is interesting. He can definitely hit. If he’s a 2B, his value skyrockets as he does have some power. 78 – Jeremiah Jackson – SS – A high school player from Alabama, he has good size (and is not done growing) and he could have some power down the road. He already has a good feel for the zone and that bodes well for the MIssissippi State commit. 98 – Grant Lavigne – 1B – He has a big frame that already has big power. The only concern is that New Hampshire is not a baseball hotbed and that he has not faced elite competition. I will be back with a full fledged draft post on Monday May 7th with my top 5 players to select at #24. While I will be out of town for a few days in Springfield, I have two posts all ready to go. On Tuesday, the April All-Star team will be released. A few surprises made the list. There are a couple of things that still need to be determined. A couple of starting pitchers could make their way onto the list with good performances today and tomorrow. On Wednesday, the Cards of the Month make their way into the light. I could have easily done a top 15 list without much effort, the pics were so good this month! Check out the monthly album for April on our Facebook account.